2017 remaster on black vinyl incl. CD of the album and poster. 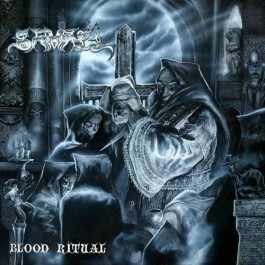 You are invited to celebrate the 25th anniversary of Swiss black/dark metal masters SAMAEL’s 1992 opus “Blood Ritual”! This vinyl edition features the LP’s original cover artwork re-created from a brand-new scan of the original painting by Axel Hermann (Asphyx, Grave, Unleashed). It reveals the painting’s more blueish vibe and was not digitally polished to show it exactly as it looks 25 years after it was created. Furthermore, “Blood Ritual” has been mastered for vinyl and CD by Patrick W. Engel / Temple Of Disharmony (Tiamat, Iced Earth, Moonspell) and includes a 60x60cm sized cover art poster as additional extra. Enjoy this gloomy masterpiece in its ultimate version!